Leicestershire History | News and Features: Richard III will stay in Leicester! So this week we may have found Richard III and if it turns out to be him, it is highly likely he will be laid to rest in none other than Leicester Cathedral! In usual royal style, if DNA tests prove that the bones were that of the last Plantagenet, they would be claimed by Westminster Abbey and buried accordingly, but yesterday there was a dramatic turn. A private secretary to the Queen has confirmed that the palace is not interested in claiming the king and would rather see him buried in Leicester – which is great news for the city! So where would this leave the king? There is strong evidence that Richard had wanted to be buried at York Minster but it is best archaeological practice to re-inter a body as close to the site of discovery as possible and that can only leave one place – Leicester Cathedral, which is where the palace believes he should rest. 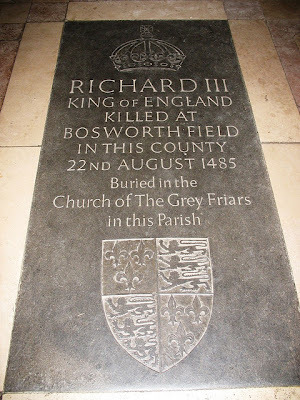 There is already a memorial stone to King Richard in front of the altar in the Cathedral so this will be the likely resting place of the king. DNA testing of the remains could take up to 12 weeks but by Christmas we should know once and for all if King Richard III is going to be Leicester’s star attraction for years to come.